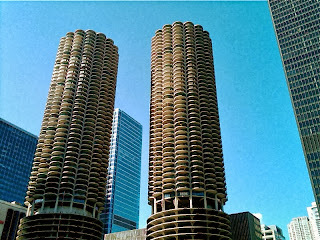 ©Laurel Delaney 2011, "Marina City Twin Towers, Chicago, Illinois, United States"
The Marina City Towers (as shown) were designed in 1959 by architect Bertrand Goldberg and completed in 1964 at a cost of $36 million. When finished, the two towers were both the tallest residential buildings and the tallest reinforced concrete structures in the world. The complex consists of two high rise corncob-shaped 65-story towers (including five-story elevator and physical plant penthouse), at 587-foot (179 m) tall. It also includes a saddle-shaped auditorium building, and a mid-rise hotel building, all contained on a raised platform adjacent to the river. Beneath the raised platform at river level is a small marina for pleasure craft, giving the structures their name. Advanced technology back in 1959!